Do you ever imagine yourself winning a Grammy award? Singer Leontyne Price won 18 Grammy awards, but it wasn't winning an award that first inspired her. When she was a little girl, Price heard the legendary African American singer Marian Anderson. "When I saw this wonderful woman come from the wings in this white satin dress," she said, "I knew instantly: one of these days, I'm going to come out of the wings . . . The light dawned. It was a magic moment." 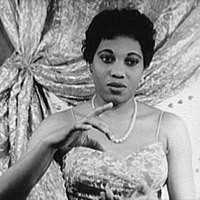 Lyric soprano Leontyne Price was born on February 10, 1927, in Laurel, Mississippi. She was only five or six years old when she started performing. What toy do you think could have started Price on the path to a singing career?